In some cases an App Widget will be significantly more useful if the user is given the opportunity to customize the data it displays and how the data is displayed. This is particularly important given that multiple instances of the same widget can be added to the home screen. It must also return a result Intent that includes an extra that describes the App Widget ID of the widget it is configuring using the extra_appwidget_id constant. This extra is included in the Intent that launches the Activity. 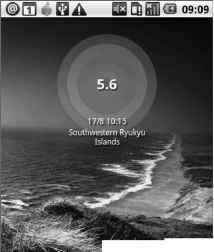 <?xml version="1.0" encoding="utf-8"?> <appwidget-provider xmlns:android="http://schemas.android.com/apk/res/android"
The following instructions show you how to create a new home-screen widget to display details for the latest earthquake detected. The UI for this widget is simple to the point of being inane; this is a side effect of keeping the example as concise as possible. Note that it does not conform to the widget style guidelines. Once completed and added to the home screen, your widget will appear as in Figure 10-2. Using a combination of the update techniques described above, this widget listens for broadcast Intents that announce an update has been performed and sets the minimum update rate to ensure it is updated once per day regardless. <LinearLayout xmlns:android="http://schemas.android.com/apk/res/android" android:orientation="horizontal" android:layout_width="fill_parent" android:layout_height="fill_parent" android:background="#F111" android:padding="5sp"> <TextView android:id="@+id/widget_magnitude" android:layout_width="wrap_content"
2. Create a stub for a new EarthquakeWidget class that extends AppWidgetProvider. You'll return to this class to update your widget with the latest quake details. 3. Create a new widget definition file, quake_widget_info.xml, and place it in the res/xml folder. Set the minimum update rate to 24 hours and set the widget dimensions to two cells wide and one cell high — 146dpx74dp. Use the widget layout you created in Step 1 for the initial layout. 4. Add your widget to the application manifest, including a reference to the widget definition resource you created in Step 3, and registering an Intent Filter for the App Widget update action. Your widget is now configured and will be available to add to the home screen. You now need to update the EarthquakeWidget class from Step 2 to update the widget to display the details of the latest quake. 5.1. The first should take an App Widget Manager and an array of widget IDs as well as the context. Later you'll extend this second stub to update the widget appearance using Remote Views. 5.2. The second method stub should take only the context, using that to obtain an instance of the AppWidgetManager. Then use the App Widget Manager to find the widget IDs of the active Earthquake widgets, passing both into the method you created in Step 5.1. 7.1. Start by updating the doRefreshEarthquakes method in the EarthquakeService to broadcast an Intent when it has completed. Your widget is now ready to be used, and will update with new earthquake details when added to the home screen and once every 24 hours thereafter. Your widget will now update once per day, and every time the Earthquake Service performs a lookup. To enhance the Earthquake Widget, consider how you could use Layered Drawables within an Image View to indicate the magnitude of the earthquake being shown. Figure 10-3 shows one possibility. Live Folders are a unique and powerful means by which your applications can expose data from their Content Providers directly on the home screen. 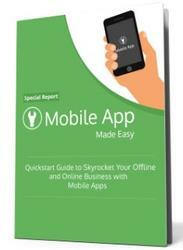 They provide dynamic shortcuts to information stored in your application. When added, a Live Folder is represented on the home screen as a shortcut icon. Selecting the icon will open the Live Folder, as shown in Figure 10-4. This figure shows a Live Folder open on an Android home screen, in this case the starred contacts list. To iSi/i/ ¿7 L/Ve Folder to the home screen, long-press a piece of empty space and select Folders. You will be presented with a list of available Live Folders; click one to select and add. Once it is added, click to open the Live Folder, and long-press to move the shortcut.